On April 3, the first concrete pouring ceremony was held at Akkuyu NPP Unit 1. Turkey and its first nuclear power plant are now officially included in the IAEA Power Reactor Information System. The concreting of the reactor building foundation signals the beginning of on-site construction operations. 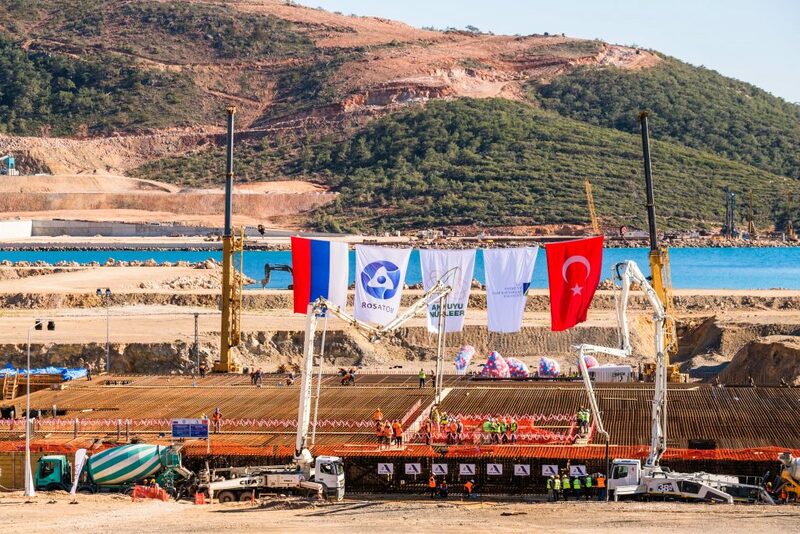 Construction of hydraulic structures on the sea shore off the Akkuyu site started in 2015; construction of auxiliary facilities began in 2016. And now, after all permits were obtained, workers have gone ahead with the reactor building construction. The plans are to time the startup of Akkuyu NPP Unit 1 in 2023 to coincide with the 100th anniversary of the Republic of Turkey. Russia voiced its intention to award a large part of project-related contracts to Turkish companies. After bringing all of Akkuyu’s four units online, the plant will satisfy 10% of power consumption in Turkey. Rosatom will build an advanced, reliable Generation III+ nuclear power plant with four VVER-1200 reactors in Turkey. It will meet all international safety standards. In Russia, such units are now constructed as standard. The first of them – Novovoronezh NPP Unit 6 – was put in operation in 2016, with Leningrad NPP-2 Unit 1 operating since February. For reference: Akkuyu is the world’s first nuclear power plant built under a BOO (Build Own Operate) model. The project owner is Akkuyu Nükleer, a 100% subsidiary of Rosatom. Total costs of the project are estimated at $20 billion. Four VVER-1200 units to be constructed at Akkuyu will have an aggregate installed capacity of 4.8 GW. The agreement signed between Russia and Turkey provides for Russian companies to have at least a 51% stake in the project owner. The remaining 49% stake will be sold to international investors. With regulated power prices, investments are expected to pay back within the first decade of operation.